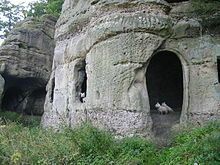 Anchor Church is the name given to a series of caves in a Keuper Sandstone (Triassic conglomerate) outcrop, close to the village of Ingleby, Derbyshire, England. The caves have been extended by human intervention to form a crude dwelling place, complete with door and window holes. The sandstone outcrop once formed part of the banks of the River Trent and the caves were formed by the action of the river on the rock. The course of the river has altered and left the caves opening onto a backwater pool. It has been designated as both a Regionally Important Geological Site, and as a Local Wildlife Site. 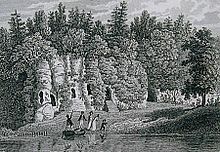 The cave featured in a painting by Thomas Smith of Derby in 1745. The Burdett family of Foremarke Hall enlarged the caves to the present size in the 18th century, fitting a door in 1845 and some additional brickwork, including a set of steps to the main entrance. 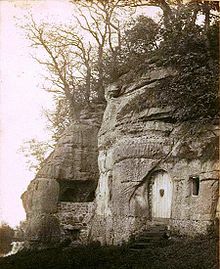 Sir Francis Burdett used the caves as a summerhouse and held picnics there. Forming part of the romantic landscape of Formarke Hall and its park in the 18th century, Anchor Church was an important destination for its owners and their guests, allowing them to walk and admire views out over the Trent valley. The caves are nowadays on the route of several popular walks in the area. Anchor Church is a Grade II listed building. In 2015, a large area of the valley over which Anchor Church has a commanding view was subject to a planning application for gravel extraction. It formed part of a 61 hectare extension to Swarkestone Quarry by Tarmac Aggregates Limited. Anchor Church is included on the list of Derbyshire Regionally Important Geological Sites (RIGS), and is also listed as a Local Wildlife Site. Species of note found here include wall pennywort (Umbilicus rupestris) which grows on the rocks themselves, plus shining pondweed (Potamogeton lucens), a very rare "Red Data List" plant in Derbyshire, found in the backwater channel below the rocks and two other sites elsewhere in the county. Other species of note recorded near Anchor Church include Eurasian otter, and 1970s records of small water-pepper (Persicaria minor). ^ a b c "Anchor Church Walk" (PDF). South Derbyshire District Council. Archived from the original (PDF) on 13 June 2011. Retrieved 12 October 2016. ^ Cameron, Kenneth (1959). 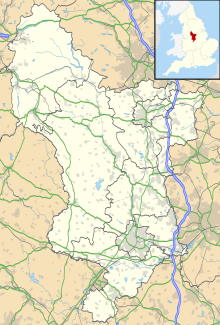 The place-names of Derbyshire. Cambridge University Press. p. 636. Retrieved 16 June 2014. ^ "CM9/1215/122 Extension to Swarkestone Quarry, Twyford Road, Barrow on Trent. Comments on the Archaeological Desk Based Assessment" (PDF). www.derbyshire.gov.uk. Derbyshire County Council Conservation and Design Team. Retrieved 31 January 2017. ^ Historic England. "Anchor Church (Grade II) (1096534)". National Heritage List for England. Retrieved 16 June 2016. ^ "Planning Application – Case file for CM9/1215/122". www.derbyshire.gov.uk. Derbyshire County Council. Retrieved 31 January 2017. ^ Bundy, Colin (October 2009). "Swarkestone Quarry, Barrow Upon Trent, Derbyshire. Extended Phase 1 Habitat Survey" (PDF). www.derbyshire.gov.uk. Middlemarch Environmental Ltd. Retrieved 31 January 2017. ^ Willmot, Alan; Moyes, Nick (2015). The Flora of Derbyshire. Pisces Publication. ISBN 978-1-874357-65-0.